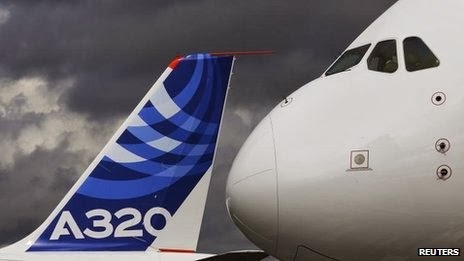 Europe's largest aerospace group, Airbus, has announced a rise in full-year profits and says it will increase output of its A320 jets. Net income rose 21% to 3.6bn euros ($5bn; £3bn) in 2013, a year when Airbus delivered a record 626 planes. Revenues rose 5% to 59.3bn euros. Airbus said it expected to deliver a similar number of planes this year. It also announced it would increase production of its A320 jets to 46 planes a month from 42 by 2016. "Based on the healthy market outlook for our best-selling A320 family and following a comprehensive assessment of our supply chain's readiness to ramp-up, we are ready to go to rate 46 by Q2 2016," said Tom Williams of Airbus. "With a record backlog of over 4,200 A320 family aircraft... we have a solid case to increase our monthly output to satisfy our customers' requirement for more of our fuel efficient aircraft." Airbus also said it would deliver its first A350 jet to Qatar Airways before the end of the year. It predicted that commercial aircraft orders would remain above delivery levels, and said it expected group revenues to remain stable. Last month, Airbus's main rival Boeing said that it expected to deliver 715-725 aircraft this year, which would be an increase of at least 10% from 2013. But at the same time, the US aerospace giant warned that future revenues and profits would be lower than analysts had forecast.